2009 April : ..the cat came back.. I know I’m late to the party but a few days ago I received a small package containing a T-Mobile G1 phone running Android. The first thing I did was go to unlock-now to get myself a SIM unlock code. After submitting my details and paying up the 17.50 EUR it was just a case of waiting for the email, about 3 hours in my case. The email details everything you need to know when unlocking, particularly useful is the info on setting up a new APN which you’ll need to do if you aren’t using T-Mobile as your carrier. My O2 PAYG SIM from my iPhone worked fine and soon the G1 was syncing happily with gmail. One of the things that struck me about the G1 was all the negative comment on it’s size and feel that I’d read in various blogs and reviews. Personally I couldn’t see and issue with either the thickness of the device or the the look and feel of it and I wasn’t alone in that. I really don’t see what all the ‘complaints’ were about. One of the things I had heard though, that I can confirm, is the poor battery life. Without installing any extra software the only real control over the G1’s power management seems limited to turning off the GPS or WiFi. However, there is a ray of light. After installing Power Manager things improved immensely but it still wasn’t enough. The solution I settled on was to buy an extended, 2400mAh, battery which came with a replacement back. The battery is physically 2 or 3 times the thickness of the original, which is why you get a replacement and the end result is a device that’s about as thick as a NOKIA N95. So why didn’t I wait for a G2? Simple really. The G1 has a wonderful physical keyboard. I really can’t stand on screen keyboards, perhaps I’m a minority. Of course the other reason that I wont be getting a G2 is that Vodafone are capping both daily and monthly usage when you sign up – 15mb / day and 500mb a month. Perhaps everyone at Vodafone still uses a 6310? Maybe they just don’t like the G2 or Android. Who knows? 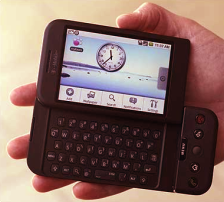 Update (Sunday 10th May) : G1 Running cupcake has been running for 3 days with the extended battery and no charging!